This is a guest post from Alicia Kazsuk, author of Plan To Be Flexible: Designing A Homeschool Year and Daily Schedule That Works For Your Family. The scene is oh-too-familiar for many of us. It’s late August and we homeschool moms are gearing up our “school marm” game. We’ve spent weeks (or maybe months) planning and thinking through our school year. Now, like finely trained heavyweight boxers, we stand outside the ring—focused on the game plan and ready to make our move. We’ve picked our curriculums, sharpened our pencils and strengthened our resolve to make…it…through…every…single…page…of…the …textbook—no matter the complaining or whining that ensues! Enter our poor, unsuspecting kids. They’ve spent the last few months thinking about anything but school. They’ve frolicked through the grandness and bliss of summer—the super-fun camps, the pool days and (perhaps) the seemingly-never-ending movie marathons and video game sessions. Equations? Essays? Being chained to a desk again? These things smack them from their summer reverie like a ton of bricks to the head. And their response to our “super-duper new school curriculum” is… less than ideal. Of course this makes School Marm’s blood pressure instantly rise, and the “need tos,” “shoulds” and “musts” start flying. And… the boxing fight-of-the-century begins! Welcome to another school year! Can I suggest a different approach? One that e-a-s-e-s everyone back into the routine… and makes school a happy place instead of a battle zone? Hang with me as we look at ten ways to make this happen. Bottom line–I don’t mean lower your expectations. Instead take a fresh approach to how you view (and “do”) school. It also helps to remove the boxing gloves (and to take some deep breaths). 1) Literally lighten up your schedule. Going back to school can be a shock to the system—for you and the kids! Why not ease into the change, like you’d slowly ease into a frigid pool? Start off with only two-thirds of your subjects (the most critical ones for your kids at this stage) and slowly introduce additional subjects into the mix as the weeks roll by. Just like the seasons gradually change from one to another, a petering in and out of the subject load is a wonderfully natural approach to learning. 2) Redefine what you call “school.” Learning doesn’t just take place at a desk, over a workbook. What can your child learn about while hiking a trail? Or spending the afternoon at the beach? Kids are born with an innate curiosity and can learn so much by simply slowing down to explore the world around us. 3) Focus your school around “being” not “doing.” If a child continually fights you about a certain subject (or even school in general), it may be time to put away the books and back way off to focus just on building lasting connections. Homeschooling’s true treasure is the potential for incredibly deep relationships between family members. 4) Design an organized but flexible schoolplan. 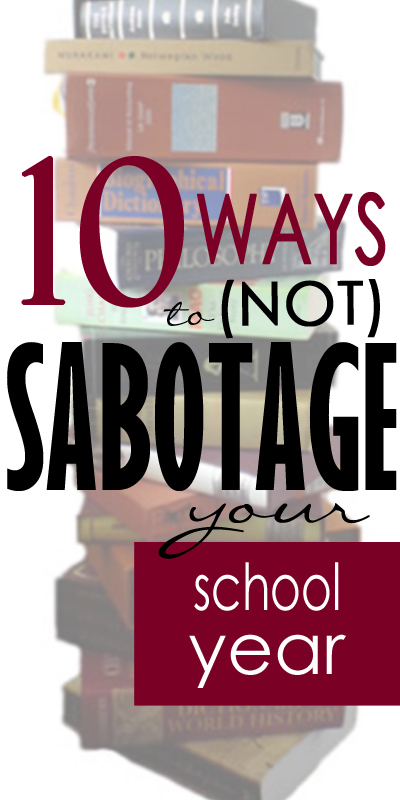 Don’t fall into the trap of laying out every detail of how your school year will pan out. In my book Plan To Be Flexible: Designing A Homeschool Year and Daily Schedule That Works For Your Family, I show how to plan out general topics for the whole year (for each subject) but fill in the details only a few weeks before. This allows for a place to collect the names of all those great books, field trips and videos for each upcoming topic, but gives freedom of what to pick once the time comes to teach. 5) Expect bumps in your schedule. If you have been a mom for more than two minutes you know that kids and the unexpected go hand-in-hand. Instead of getting upset when they happen, expect them. And keep things flexible enough to allow room for interruptions. 6) Consolidate subjects whenever possible. Oh, school is much more manageable when everyone learns the same topic! Of course each child can respond to the topic differently (an eighth-grader might write an essay about the causes of the Civil War, while a kindergartner might pretend what it was like to live on a plantation in the South). 7) Don’t forget to include breaks (for you and them). Running around outside or playing with toys for 15 minutes results in fresh, rejuvenated minds that are ready to tackle more learning. 8) Play to your children’s strengths (and likes). What do they enjoy? How can you incorporate their learning styles (and personal likes and dislikes) into their subjects? 9) Make learning more like play. Games, puzzles, outdoor activities: there are so many wonderful non-traditional learning resources! They’re also a great way to ease kids into the school year (or to help kids who are burnt out on traditional schooling methods). 10) Relax and enjoy this time with your kids! Homeschooling is not about getting our kids to “arrive” at a certain point of knowledge or skill. Truly, the “education” (and the joy) happens in embracing life’s daily learning opportunities. Search for the hidden gifts of the everyday (even those difficult “everydays”) and enjoy these wonderful lessons together. Alicia Kazsuk is the author of Plan To Be Flexible: Designing A Homeschool Year and Daily Schedule That Works For Your Family. She is also a magazine editor-turned-homeschool-mom of four bright, curious students. Although her days are now filled with requests for peanut butter and jelly sandwiches instead of requests for interviews, she still happily uses her red pen to grade her kids’ writing assignments. You can read more about her journey through life, motherhood and all things crafty at her award-winning blog thevintagecreative.com. Well written & exactly what I needed to see this morning. I embrace the flexibility & non traditional homeschooling life my family lives, but this time of year has a way of making me feel pressured to be the “perfect” teacher. Thank you for this. I started my daughter back a few weeks ago because I wanted to “be ahead of the game” so to speak. We are planning our first ever family vacation for next month and did not want to have to take school stuff with us. I also seem to have in my head that the kids school work needs to be done a certain way, by a certain time and they only have so much time for each subject. I have two homeschooling this year, my daughter is doing 2nd grade work and I have a preschooler. My daughter can get frazzled very easily but normally she does very well. We have 5 subjects that I like to get done daily (Bible, Language Arts, Math, Science, and History/Geography), and there are others that we do when we have the time (PE, Art, and Music to name a few). My daughter does fine with everything except for math, she will bust through her other 4 subjects in no time but as soon as I pull out her math work world war three rears its ugly head (it can take her 2 plus hours to do two pages, front and back, of math work) but as soon as I give her a video game, or any sort of game really, that has math in it she has no problem with it, but it is hard to show progress for the end of year evaluation that way. I need to get out of my head that things need to be done on my schedule and let the kids have more freedom in theirs. Thank you for this! I’m starting our 2nd year with our 4&7 yr old boys next week! As much as I’m enthused to start the new school year, they are reluctant. What’s to be expected? We had a wonderful summer! Thanks for putting it into this perspective!!! i think your ideas are amazing. my 2nd grader really likes feeling like she learns something everywhere she goes. i am just wondering how can i have more of a relaxed learning environment with my 8th grade son. he had a really hard time in public school. he had an iep and always had trouble keeping up with the other kids. so he hates the idea of learning or being taught. he does the work i make him do but i am not sure how to encourage a child his age to want to learn. if you have any ideas on how to trick him into having fun learning let me know. thanks. Brilliant as usual, Jamerrill. We are year round homeschoolers and this advice even applies to us. The Lord has blessed you with such wonderful motherly wisdom.